Thanks to a malfunction in Donatello’s “Healthometer,” an invention designed to diagnose one’s health, Raphael is convinced that he is not long for this world. Raph decides to make the world a better place with what little time he has left. Meanwhile, Burne Thompson has assigned Vernon to cover the eruption of a volcano on the Island of Poppalua and April to cover the dedication of a new species of lily at the local Flower Society Club. Raphael, disguised in a Musketeer costume and calling himself “The Green Defender”, risks his life by stopping crime all over the City. The “terminal” terrapin even rescues a cat off of a ledge of a high-rise apartment building. Back at the Turtles’ Lair, Donatello repairs the “Healthometer” and searches for Raphael to tell him that he is okay and that the invention was broken, only to discover Raph’s farewell note. The Turtles join April and scour The City for Raphael/The Green Defender. Meanwhile, a Professor Wilhelm Vanilli is angry that LaVerne Forsythe, president of the Flower Society Club, has named the recently discovered species (discovered by Professor Vanilli himself) of lily after herself. Vanilli vows to kill every living plant on the planet for revenge by dropping a canister of the toxic chemical into the volcano on the Island of Poppalua. 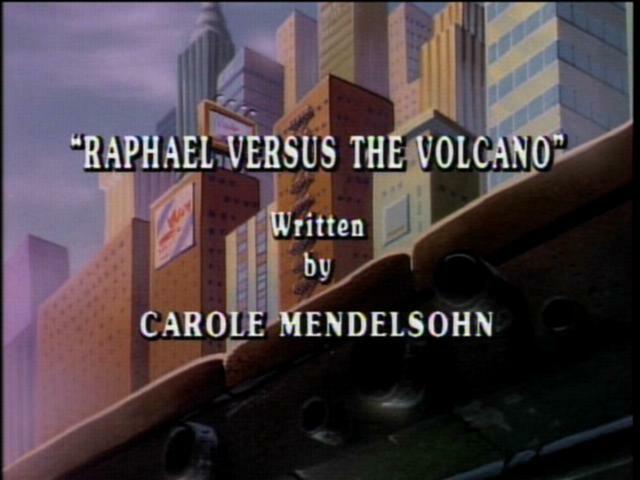 When Raphael sees the live broadcast of Professor Vanilli’s threat, he takes the Turtle Blimp and heads for the island of Poppalua. The other Turtles team up with April as she is assigned to cover the story as well. 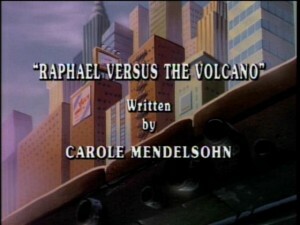 They arrive in the Channel Six News Helicopter just in time to see Raphael leap into the volcano. With the help of the other Turtles, Raphael/The Green Defender saves the world’s vegetation.